Back in the early days of 4-H many of the top achievers had lofty goals and were true leaders among their peers. They took full advantage of the newly created 4-H events – the camps, the judging contests, and National 4-H Club Congress in Chicago. We are fortunate that some of these young members documented their thoughts and experiences. Two of them wrote books which have now been digitized and are in the Books Archives on the 4-H History Preservation website at http://4-HHistoryPreservation.com. Kenneth Hinshaw, from Washington State, attended the 1926 National 4-H Club Congress in Chicago and was selected the national leadership champion, becoming a proud recipient of the Moses Trophy. Kenneth wrote a book, “4-H A Story” in 1935 weaving together actual 4-H experiences, historical sketches of Boys’ and Girls’ 4-H Club Work, and chronicles of important 4-H events. And across the country, Charlie Goodwin, a young 4-H boy from Guilford, New York, wrote his autobiography, “A Dreamer and His Dreams,” in 1928. The story relates how Charlie started out with big dreams, but little resources, winning little by little until he was a top achiever and leader. He attended many of the state and national judging events of the day, won a trip to Camp Vail and was a delegate to the first National 4-H Camp in Washington, DC, and a delegate to National 4-H Club Congress in Chicago the first year his state sent delegates. The National 4-H History Preservation leadership team strongly suspects that there may be other printed documentation of 4-H’ers sharing their experiences, either in published form or unpublished manuscripts. If you know of other efforts of this nature that we could borrow to have digitized for the history website, we would like to hear about them. Write to: Info@4-HHistoryPreservation.com. 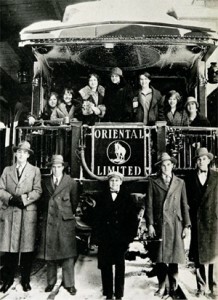 As shown in the Hinshaw book, a party of 4-H club members from Oregon, Washington and Idaho enroute to the National 4-H Club Congress in Chicago in 1926. Kenneth Hinshaw is standing on the left in the photo. 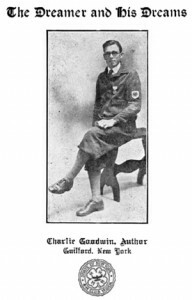 Cover photo of Charlie Goodwin’s autobiography showing the proud author in his 4-H uniform. This entry was posted in History and tagged 4-H History, Charlie Goodwin, Kenneth Hinshae by Larry Krug. Bookmark the permalink.